6 lazy ways: How to play Pokémon Go without moving! How do I catch Pokémon without moving? Here are some lazy ways to play everyone's favorite augmented reality game! Confession: When I first opened up Pokémon Go and realized I was looking at a full-on map of my surrounding area, my legs started to ache almost immediately. "You mean I'm going to have to actually leave my house to play this game," I asked myself. While it's true you'll have to leave the comfort of your home if you want to get good at Pokémon Go, it doesn't mean you can't hold on to some laziness. Here are some great tips to keep your couch potato pride. Open up Pokémon Go, plug in your phone, and scroll through your Twitter timeline elsewhere. If you keep the game up and running, your chances of encountering a Pokémon are greater. If you're looking for rare Pokémon, you're not going to find them this way. I was able to snag a few Rattatas, though. You'll find incense among the items you're given when you first start playing Pokémon Go. Incense draws nearby Pokémon to your location, so you don't have to go to them. Ah, sweet, sweet laziness. Tap the Poké Ball at the bottom of the screen. The incense pot will appear on your main screen. Tapping it again will activate the luring effect for a period of 30 minutes. NOTE: The timer will continue to count down even if you leave the app. 3. Use a Lure Module at a PokéStop. A Lure Module is a more powerful form of incense. You use Lure Modules by heading to a PokéStop and activating them at that location. Because Lure Modules benefit all Trainers (unlike incense, which only benefits you), you can usually spread the love (and the cost) among Trainers at a PokéStop. This will still require some effort from you — you'll have to find a way to get to the PokéStop — but I have faith in you! Laziness knows no bounds. Visit a PokéStop by tapping it on the map. If no Lure Module is active (you'll know there's an active Lure Module if you can see pink petals floating around the PokéStop), tap the rectangle at the top of the screen that says Empty Module slot. Tap to add a Lure Module from your inventory. First thing's first: Do not Pokémon Go and drive. Not only is it dangerously distracting, it's also not the laziest option. Let someone else drive you around while you hurl PokéBalls at every turn. My partner caught about six Pokémon yesterday whilst I served as the Pokémon chauffeur. Some relationship advice: Take turns chauffeuring; everyone's Pokédex deserves some attention! It's a good idea to install and play Pokémon Go on whatever device it is you take with you everywhere you go (Hint: Skip the iPad). Chances are, you're going to have to get out of the house at some point — to go to the grocery store, to go to work, to visit the doctor, to have dinner with friends, etc. — you might as well use that necessary travel time to catch some Pokémon. Sure, it's the not the laziest option you can take, but at least you're not making physical activity plans for the sole purpose of catching Pokémon. Sounds exhausting! 6. You don't need to walk to hatch that egg! If you've come across a Pokémon egg, you've likely figured out their hatching cycle is tied to the distance you walk. There are 2-, 5-, and 10-kilometer eggs — move that distance, and the egg hatches. Agreed. Luckily, to the tiny mechanisms in our phone that sense movement, movement is movement is movement. So as long as you can make the app think you're moving, it'll add to the kilometer total. There's one problem, though: Pokémon Go tries to thwart our lazy ways by putting a speed-cap on the movement. In other words, you won't be any closer to hatching your egg if you hop in the car and drive 10 kilometers; the car is too fast. Hop on your bicycle and go for a slow ride (thanks to Silph Road, we've discovered that you can't go faster than 10.5 km/h). Is the GPS signal in your location weak? Close and open the game over and over again to earn fractions of meters. You can also try simply moving your device back and forth at your desk to trick the game into thinking you are moving. Own a Roomba? Get one and attach your phone to it. Clean and hatch Pokémon eggs without moving a muscle. You're probably getting the idea by now: As long as it doesn't move too fast, you can trick the app into thinking you're walking. Note: Pokémon Go determines your movement for hatching eggs by logging your location from point A to point B and then calculating the distance. You won't be able to hatch an egg by putting your device on a record player or taping it to your ceiling fan. 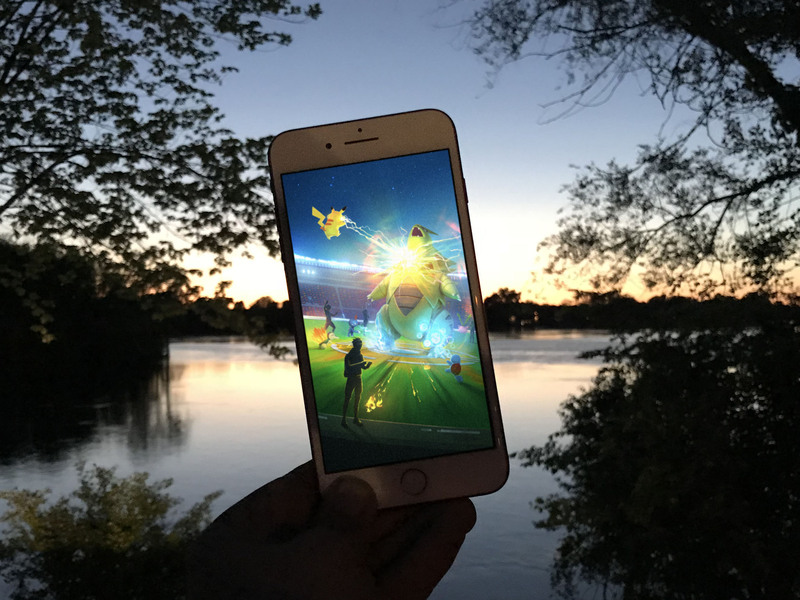 How do you take the "Go" out of Pokémon Go? Share your tips on social, or in the comments below. I'm counting on you to keep me from having to move a muscle!